Long ago, before most families had cameras, there were postcards. Often, the only pictures available for people to share with faraway family and friends were postcards. In many small towns, the only pictures of your high school, the businesses in your town, and even the house you lived in, were the postcards sold at the corner candy store. Just after the turn of the century, collecting postcards was a popular pastime. A postcard album was the family photo album. But this page is not just about postcards. This page is about Candor. 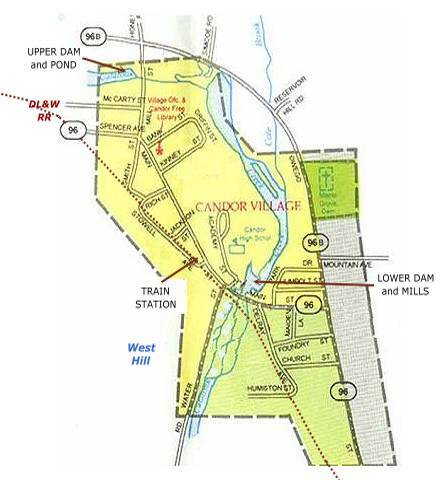 Candor is a small town in upstate New York. Most of Candor’s photographic history exists only in these postcards. Like many small towns, much of what you’ll see in these postcards no longer exists. Unlike most small towns, Candor was fortunate to have two photographers who produced many local postcards, not knowing they were saving the pictorial history of small town Victorian America. Village Map Links Candor, Oise, Fr.